'Marx was right' - even Stephen King, HSBC Banking Group's Chief Economist, doesn't deny that now. This is a cause of great confidence for socialists and this confidence and enthusiasm for Marxist ideas were reflected at the Socialist Party's national conference which took place from 14 to 16 March in London. These two pages give a flavour of the discussions that took place. 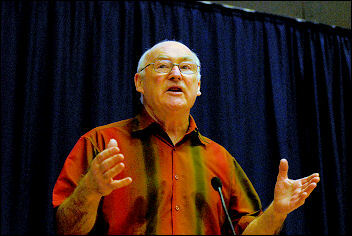 Socialist Party general secretary Peter Taaffe introduced the first discussion, on the world economy and perspectives for Britain. This provided the background to all the other discussions over the weekend. The great scientist Albert Einstein once declared that "imagination" is a vital attribute of science. Peter commented that Marxists also need imagination to foresee mass working-class movements during periods such as the one we have been through, when there was a certain lull in the class struggle. But now things have definitely changed. The vast majority of capitalist commentators have been taken by surprise by the current economic disaster, but the method of Marxism predicted events with uncanny accuracy. This economic crisis will cause misery for millions of working-class people; it is us who will pay the price. Politicians such as Alistair Darling and Ed Balls are competing to outbid each other on how long ago it has been since we have seen a crisis on this scale. But these events have been a demoralising blow for the ruling class to the ideology of capitalism. Marx has appeared in the pages of many serious journals of capitalism, with headlines such as the Independent's: "Was Marx right all along?" It is significant that US president Obama had to defend himself against accusations of being a 'socialist'. These references will be noticed by young people and workers who are searching for answers. In Britain we have seen a fightback in the construction workers' struggle at Lindsey oil refinery - like the overture to a future symphony. Unfortunately, on a national scale, trade union leaders have left workers totally unprepared for what is to come. There has never been a greater gap between the objective situation and the understanding of the mass of the population that a socialist fightback is needed. However this consciousness can rapidly 'catch up' as struggles develop. Whatever happens, there will be no going back to the period of the 1990s and early 2000s. Governments around the world are attempting to deal with the recession with 'stimulus packages', pumping huge amounts of money into the economy. At best these are likely only to cushion the crisis not solve it. It is not just a problem of credit, but of demand. There is a crisis of 'overproduction'. The banks could make as much credit as they like available but will firms use it if they can't sell their goods? How can workers, suffering pay cuts and unemployment and facing an uncertain future, continue to shop? In desperation some governments are now carrying out 'quantitative easing', a euphemism for electronically printing money, in the hope that they can stimulate demand. Gone are their previous fears of inflation. They have also carried out the virtual nationalisation of banks, although in such a way as to leave the old bosses in charge. They are so frightened by the possibility that working-class people will demand the nationalisation of other sectors that in the US, for example, it has been referred to as "pre-privatisation"! At the same time Mandelson is trying to privatise the Royal Mail. Opinion polls on rail, for example, show overwhelming support for nationalisation and opposition to privatisation. Many people will draw the conclusion that if the banks can be nationalised, then why not Woolies or other firms that threaten job cuts? If there was a mass workers' party to challenge the main parties and argue these points, this idea would get a huge response. Massive attacks on public services are also in the pipeline, with big job cuts already taking place and more to come. However, most of the leaders of the big unions are not prepared to challenge capitalism. They accept its logic that workers have to pay for the crisis, the false idea that if workers take pay cuts they can save their jobs, for example. On the political front they remain tied to the New Labour government, giving millions of pounds to the Labour party while it attacks their members. The working class is without a mass party of its own. It is unlikely that Labour could swing back to the left again. Disillusionment in Labour raises the likelihood that the Tories will come to power, although the political situation is volatile. There is also the threat of the far right and the BNP. But steps towards workers' political representation, such as the RMT's initiative for the European elections, have the potential to undercut this. Lynn Walsh, editor of Socialism Today, replied to a lively and wide-ranging discussion, concluding that a new period is opening up which means huge opportunities for the building of support for socialist ideas. The 20th century was one of revolutions, but also defeats. The 21st century can be one of socialism and Marxism. Following the opening discussion on the political situation in the world and Britain, congress moved on to its second major discussion, which was on building the Socialist Party. Hannah Sell introduced the session on behalf of the party's executive committee. She outlined the significant role that Socialist Party members have played in many campaigns and struggles over the last year, and summarised the key tasks facing members in the next few months. The number of people joining the party each month has increased this year compared with last year. Emphasis was placed on the need to speed up this growth in our forces further, in the light of the world economic crisis and the need for us to put forward a socialist alternative as widely as possible. It was also stressed that party branches need to help new members to develop quickly into being activists in the campaigning work and interventions the party is involved in, and into recruiting to the party to speed forward its growth. Encouraging new members to read and discuss as much political material as they can - both Marxist theory and present analysis - is also important. During the discussion, congress delegates gave very inspiring reports of progress in building their branches. Some branches have been built from scratch in recent months, while others have filled out to the point where they need to be divided into two. In cases where branches lack members from key sections of society, for example having mainly young members and not older workers, or not having enough female members, other branches suggested ways of improving the balance. Following a reply to the discussion from the executive committee, votes were taken on a national committee statement summarising the party's tasks and also on a resolution from the Lewisham branch (London) on promoting socialist ideas among gay, lesbian, bisexual and transgender workers. Both were agreed. Later in the congress, the party's main financial statements were agreed by delegates, and a national committee, national auditors and a national appeals committee were elected unanimously. In his introduction to the session on trade union work Bill Mullins, Socialist Party industrial organiser, pointed out that while the New Labour government loads this economic crisis onto the working class, most union leaderships are failing to lead a fightback. However there have been some very important struggles, with the Socialist Party often playing a key role. Socialist Party members played an important part in the Lindsey oil refinery victory. Seven newsletters were produced during the dispute, putting forward a programme to defend trade union won pay and conditions for all workers. This has been applauded by the wider labour movement. A further victory has been won at Lindsey. After more strike action was threatened, blacklisted worker John McEwan was given a job. 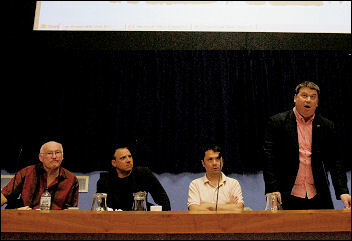 The Socialist Party helped to initiate the National Shop Stewards Network in 2007. This year has already shown the potential for such a network. Forty reps and stewards attended a recent NSSN meeting in Brighton and eight car plants were represented at the recent NSSN car industry meeting. Socialist Party members also helped workers to organise the unofficial walkout at the Southampton Ford plant. During the discussion Martin Powell-Davies, branch secretary of Lewisham NUT teachers' union, explained how the NUT leadership had failed to organise further action after the national strike last year. Martin will stand for the national vice president position in the autumn on a fighting platform, particularly over workload issues. A member of the journalists' union, the NUJ, explained the struggles against job cuts developing at a number of newspapers. A number of Socialist Party Unison members spoke of the attacks on pay and conditions in their areas with no fightback from a rotten union leadership. The attacks on the Socialist Party in Unison have resulted in huge support for the Defend the Four campaign [see Stop the witch-hunt]. The imminent NEC elections will be an opportunity to ensure a left leadership is elected that can fight for its members and bring about a democratic union. A delegate from eastern region explained how his branch had leafleted the GlaxoSmithKline site in Hertfordshire and brought together workers who wanted to fight back against job cuts, unlike the stewards in the plant. Jacqui Berry, president of Medway trades council, described how her Socialist Party branch had participated in the Isle of Grain power station protests over pay and conditions. Helen, a young PCS member from Newcastle said she had been described as a 'Bolshie young member' in her workplace. 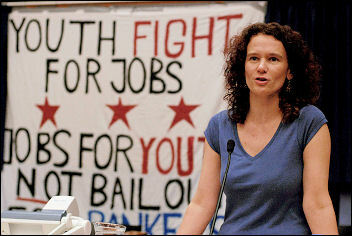 She explained the necessity of being Bolshie, faced with the appalling working conditions of young workers. 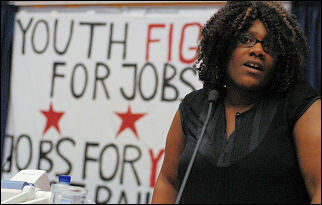 She urged young trade union members to take positions in their union. Socialist Party industrial co-organiser Jane James concluded the discussion by explaining that, with the backing of the Socialist Party, an individual party member can play a key role in their workplace. Party branches should also visit workplaces with leaflets and copies of The Socialist. With the attempts to make workers pay for the bosses' crisis sudden protests and strikes can take place and we must be ready to offer our support. The youth session showed many young Socialist Party members are getting stuck in to the Youth Fight for Jobs (YFfJ) campaign, challenging low-pay, casualisation, the growing scarcity of jobs, attacks on education and even forcible eviction by bailiffs! Public meetings and a number of days of action will be taking place, with plans to dress up as bankers flaunting bailout swag. Many trade union branches have already signed up to support the campaign. Building such a campaign provides vital lessons. Speakers described some of the tricky questions young people can ask and how experience can help to answer them. Young Socialist Party members are driving on the YFfJ campaign, often with a great deal of energy, imagination and creativity. 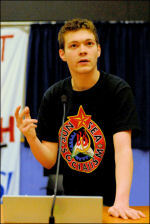 In replying to the session Socialist Party youth organiser Ben Robinson called on all members to urgently turn to the task of building for the 'March for Jobs' on 2 April [details on the front page]. A number of university students spoke about the occupations that were organised on campuses in response to the invasion of Gaza. For many this was the first action they had been involved in and they described the lessons learned during the experience. 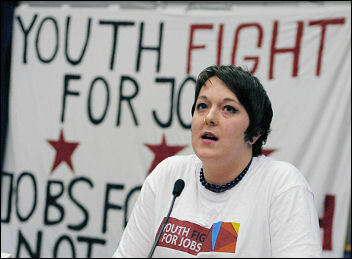 The session also demonstrated how socialist politics has inspired young party members to become active trade unionists. Overall the energy, confidence and determination shown by the young men and women who spoke was impressive, many of whom had only recently joined the party. This was illustrated by a new member from Bangor. He explained how making a class appeal to the security guards at his college meant he was able to carry on campaigning. This meant he could raise socialist ideas among the other students who have not, as he described it, "yet" joined the Socialist Party! A whistle-stop tour rounded off the party congress, as Tony Saunois, secretary of the Committee for a Workers' International (CWI), took us around the world in 50 minutes. We hurtled straight into four general strikes in Greece, the rise of Syriza - a broad, left/ecological alliance - the direction it needs to take, and the danger of riots instead of a strategy to bring down the government. Maintaining a clear banner and platform while working constructively as part of Syriza, Xekinima (CWI Greece) has resisted moves to take Syriza in a rightward direction. This was one of the themes. For the left alliance-type formations which are emerging in a number of countries to really impact on events, they must engage in active class struggle, alongside election campaigns. France is volatile. A one-day general strike looms on 19 March. The last stoppage on 29 January brought two million workers and young people onto the streets. And the general strike in Guadeloupe has galvanised France, with 78% backing the strike, and 65% saying it could happen in France. However, there is mounting frustration that the trade union leaders have not united the movement effectively. Holding occasional one-day strikes is not taking the movement forward in any meaningful way. This is the background to the setting up of the Nouveau Parti Anti-capitaliste (NPA). Gauche Révolutionnaire (CWI France) is the only openly identified left group in the NPA and argues for the need for a class-struggle programme and strategy, if the NPA is to realise its full potential. The transformation of Ireland from Celtic tiger to complete economic basket case has ignited political turmoil and industrial struggle. 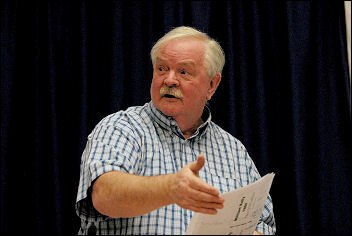 Although temporarily without a parliamentary seat, Joe Higgins continues to be the thorn in the side of the political establishment, using newspaper columns and interviews, picket line visits and Socialist Party public meetings to voice the concerns of working-class people. The stand we took in Britain for international workers' solidarity during the Lindsey oil refinery strike has been noted by activists in Italy.The leaflet we produced in Italian to cut across media misrepresentation was distributed and discussed by activists there. Developments in Germany, Spain and Portugal were outlined, too. The economic, political and social upheavals seen in Europe are magnified a hundred fold in the neo-colonial world, with areas of Asia and Africa suffering social disintegration. The slaughter of the Tamil people in Sri Lanka is one horrific example. Tony outlined developments in Pakistan and Africa, the numerous links being made with socialists around the world, and the recent CWI Latin America school in Brazil, which drew together socialists from around the continent. Socialist Party branches should ensure that there are report backs of this important congress session to convey the details of the many other developments under way. The work of the CWI sections is truly inspirational. The current economic crisis has already thrown up convulsive movements of the working class, and CWI members have risen to the challenge. Our ultimate aim is to help build a working-class movement that can bring about a democratic, socialist system internationally. We all have a role to play in building the framework for a workers' international worthy of that goal. See www.socialistworld.net for further reports and updates. The discussion on Socialist Party publications was introduced by The Socialist editor Judy Beishon. Judy described how The Socialist is a workers' paper, written by activists and campaigners. Every Socialist Party member should see themselves as a correspondent for the paper. A number of members have written articles describing their day-to-day experiences in the workplace and Judy appealed for more like this, as well as for other types of article and for feedback about the paper's content. Manny Thain appealed to members to approach bookshops to sell the Socialist Party magazine Socialism Today. The importance of party leaflets, pamphlets and books was also raised in the discussion, as was the role the internet now plays, including the showing of video clips. Peter Knight from Brighton proposed that Socialist Party members should always carry copies of The Socialist with them and that this could help meet personal sales targets. Trevor Prior from Wythenshawe described how one person donated half of their weekly disability allowance to the party after reading our paper. 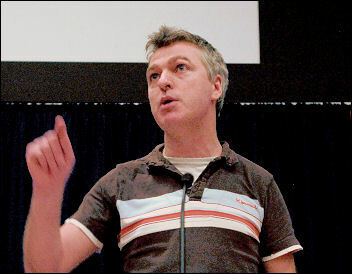 Wales Socialist Party secretary Alec Thraves spoke about the role of the paper when responding to events. Bridgend Socialist Party sold out of papers on a stall campaigning against Royal Mail privatisation. The deputy editor of Socialism Today, Clive Heemskerk, closed the discussion by saying that the party's publications should represent the collective experience of the Socialist Party. The national committee resolution on publications was passed unanimously which included that the national subscription target will be increased by 100 each quarter over the next year while aiming to improve average weekly sales by 490 over the same period. Help show your support for The Socialist on International Workers' Day with a May Day Greeting from your trade union, student society, campaign group or Socialist Party branch. Phone 020 8988 8796 or email circulation@socialistparty.org.uk for more details. Greeting deadline: Friday 10 April. The congress finance appeal raised an excellent £11,500. The appeal was opened by Sarah Sachs-Eldridge with a slideshow. Sarah used the analogy of how a red sock in a white wash can turn your clothes pink in a cold wash, to describe the important but limited impact socialists have in a period of low class struggle. However, with the crisis of capitalism we are now entering a 'hot wash' period of heightened activity, which would enable the red sock to colour many of the whites red. An abstract concept, but very pertinent for these times! Another slide showed an energetic demonstration with activists holding placards, banners, leaflets and papers. The slide was then gradually altered so that none of the Socialist Party political material could be seen - it looked startlingly different. This highlighted how important the fighting fund is, as no production of Socialist Party material for campaigns and demonstrations would be possible without money.